SENOIA, G.A.— June 3, 2017— The World of Outlaws Craftsman® Late Model Series took the track at Senoia Raceway for the first time ever for the third annual Billy Clanton Classic. Despite this race being many of the drivers first time on the unique gray gumbo surface, everyone seemed to enjoy how racy the track was all night long. It was ultimately Brandon Sheppard who was able to hold off the field to land his fifth Series win of the season. Tyler Erb left everything he had on the track come the checker flag but he came up just a little short. The young gun was putting Sheppard to work throughout all 50-laps as he was trying find the line to his first Series win. With the help of lap traffic, Erb was able to cut down Sheppard’s lead to only .6 seconds but unfortunately a few cautions would throw away the ground he had gained on the leader and eliminated the obstacles for Sheppard. 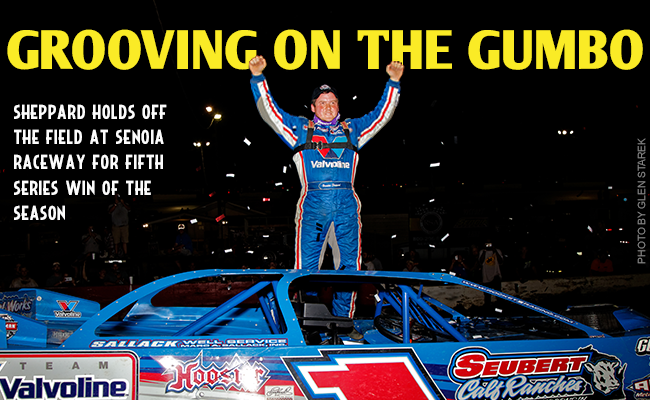 Eric Wells also found his way to the podium but it wasn’t an easy task to get there. Wells, Erb, and Clanton found themselves three wide throughout the feature event dueling for second and third. Chub Frank also found himself into the mix with Erb, Wells and Clanton after battling with Devin Moran and Clint Smith in similar fashion. Although Clanton finished one spot short of the podium he was still all smiles in Victory Lane as he spoke about his late father, Billy Clanton, and the race that was created in his honor three years ago. The next stop for the Series will be in Ontario for two nights of shootouts at Brighton Speedway on June 17 and Cornwall Motor Speedway on June 18. Chris Madden broke his drive shaft during the heat races which took him out of the race and put him in to the Last Chance Showdown. Madden started seventh in the Last Chance Showdown but was able to prove how capable he was at maneuvering around the track after passing eight cars to win. Madden was then placed 19th in the feature before sailing at lightning speed to claim the fifth-place finish.